The film is a romantic comedy about two strangers who get locked in an apartment after a one-night stand because of a police lock-down. This one should be very interesting to see this week! “Think of ‘When Harry Met Sally’ meets the ‘Hangover’ when you consider the format of our heartfelt yet hysterical movie,” filmmaker David Vargas told Sebastian Daily. Vargas says they are ending their successful festival run at Vero Beach this week after winning three film festivals in Florida between 2016-17. 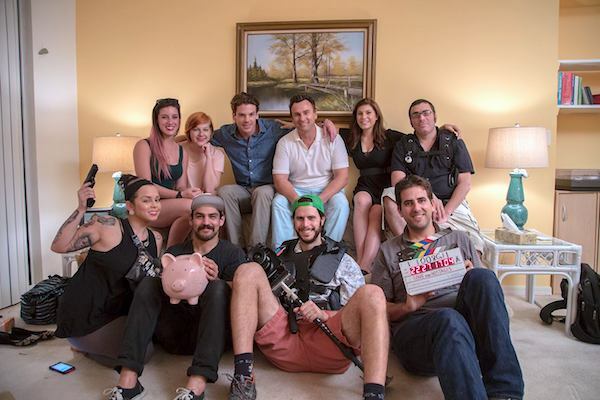 “Love and Hostages” is a locally produced film by Miami filmmakers, David A. Vargas and Javier Mayol, that was funded entirely through a successful Kickstarter campaign. Since its completion in early 2016, Love and Hostages has been critically acclaimed by distinguished reviewers and audiences all over the United States. There will be two screenings of the film at the Vero Beach Wine and Film Festival this week. The film is showing on Thursday at 12:30 p.m. at the Heritage Center, and again on Friday at 1:00 p.m. at the Riverside Theater Stark. The ‘Love and Hostages’ film crew. You can view more info about the film their Love and Hostages website. There is also a YouTube film trailer about the picture to give you a sneak peak behind the scenes. The Vero Beach Film and Wine Festival is from Thursday, June 8th through Sunday, June 11th.